Just back from a few days on a run'n'gun reality gig. Most of what that show requires for audio is wireless lavs, and lots of them, with only occasional booming. They use Lectrosonics 400 series for the talent, with the 200 series employed for wireless camera hop. Lectros are generally considered an industry standard, and rightly so. They sound great, are tough as nails, and are about as ubiquitous as Sony 7506 headphones. But, damn, are they spendy. Luckily, there are now high-quality alternatives available for the newbie mixer and independent filmmaker. One such option is the Sennheiser G2 Evolution Wireless system, which I chose for my kit. The G2s come in two flavors. The standard package includes with a transmitter, receiver, omni lav mic, windscreen, alligator clip, belt clips, mini-to-mini cable, and mini-to-XLR cable. 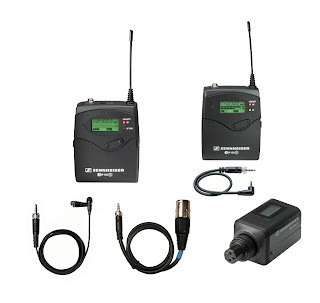 The ENG package adds a plug-on transmitter, turning any mic wireless, among other uses. 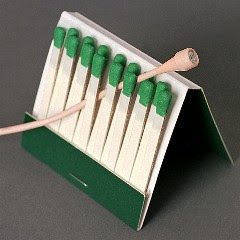 The G2s are compact, smaller than a deck of playing cards. The units have a metal body with a hard plastic flip cover that protects both the battery compartment as well as the menu and select buttons. Being a non-diversity system, each unit sports a single, flexible, permanent antenna. See? Small. You like? You like? In addition to the size being reduced from the previous model, Sennheiser has also eschewed 9 volt batteries for AA, as have many manufacturers. While AAs are gaining as the new standard, you have no option to power the units from an NP1 battery, through a battery distribution system (trust me, once you've powered up your entire bag by either plugging in one NP1 or, with some models, flipping a switch, it's hard to go back to turning every single thing on one-at-a-time). Each unit has an LCD display screen that is easily readable even in direct sunlight, with a nuclear-green back-light. The menus are fairly straight-forward (check out this video that I've blogged about before), and easy to step through. However, since the displays are face-mounted (ie parallel to the belt clips), they can't be seen with the units mounted in an audio bag without reaching in and twisting each one up to face you directly. While this may not be an issue most of the time, it can be frustrating if you have a lot of mics to check in a hurry. The Evolution systems are frequency-agile, meaning that you can make changes on-the-fly if you encounter interference, which is a boon to any wireless set-up. In the old days, if you had issues, that was it: no soup for you. Now, you can use the scanning function to see which out of 1440 different frequencies are available, and hopefully avoid any problems before you roll. I ended up choosing two standard kits along with two ENG kits. I figured that this would grant me some flexibility depending on the needs of the scene: four wireless lavs while being hard-wired to camera; two wireless lavs with a wireless hop to camera; or a wireless boom set up. I mentioned earlier that the kits come with the Sennheiser ME 2 omni lav mic, but I opted to replace these with the Countryman B3, mainly due to the fact that the Sennheiser is about the diameter of a pen, and thus not so easy to hide on talent. I keep the Sennheisers as back-ups, but so far haven't had a single problem with the B3s, even with the dust and sweat encountered on a hot location. The B3 is an omni lav, available in many different colors. It's about .2 of an inch in diameter, and thus easily concealable (for one scene, wardrobe cut a very small hole in the handkerchief pocket of a man's suit coat, allowing us to place the mic in plain sight). The mic can accept interchangeable caps that tune its frequency response; I was satisfied with the standard flat response caps that came with the mics . If you get a different mic for the system, you need to have it pinned out for the G2 transmitter, which uses a locking 1/8-inch (3.5mm) TRS connector (think small headphone jack). The fact that they chose a locking collar means that even in the event that one of the units goes flying, it won't go far. However, the narrow threads also mean that mic changes don't happen as fluidly or quickly as other wireless options. One unexpected benefit of the mini-jack connector is its compatibility with headphone jacks.This enabled us to employ one wireless system as an ad-hoc IFB, sending audio out of one channel of my mixer to a plug-on transmitter, and then having my boom op plug his cans into the corresponding receiver. The pin assignments only allowed him to hear in one ear, but it was enough to get the job done. In conjunction with his monitor, we rigged the plug-on transmitter to the boom (the mic was self-powered), allowing him complete freedom around the set. Not the most elegant of solutions, but it worked. Like many wireless systems, the G2s employ a companding noise reduction system. While it's a proven technology, you can occasionally hear "pumping", an artifact common to companders. It was especially noticeable when comparing the sound of a hard-wired boom and the wireless, but was still perfectly usable. Beyond that, they sound great. The Countrymans came through loud and clear, and the level adjustments available on both the transmitters and receivers gave us plenty of leeway when switching a mic between a loud, stage-trained veteran and a shy, child actor. Where we repeatedly banged our heads against the wall was RF interference. While I'm still a novice when it comes to wireless, I can generally make things work with the help of the manual and the internets, but I ran into things I had absolutely no solution for on this movie. We had a good many issues out on an actual multi-track railroad line. I wonder if the the steel of the rails, in addition to the stationary metal cars used for background, may have been absorbing quite a bit of signal, reducing our effective transmitting range. Other times, we had spurious noises that I suspect were caused by either undue tension on the transmitter antennae, contact between the antenna and sweaty skin, or both. Since the interference was sporadic, all we could do was make adjustments and cross our fingers for the next take. I've since used the G2s in a run'n'gun TV sports shoot. There, our issues were mainly interference from other wireless transmitters (booth hawkers with wireless PA mics; walkie-talkies; other wireless for the network crews covering the event). In some instances, we would encounter drop-outs on walk-and-talk shots. I would scan the chosen bank of open frequencies at the start, and most, if not all would be clear. But as we moved (sometimes not more than fifty feet), we ran into trouble, and would have to cut, re-set the mics, and pick up the shot from there. Luckily, the producers were very understanding about how difficult the environment proved to be. Pros: small; light (makes a huge difference when you're bagged up all day); affordable; frequency-agile; easy to use, even for novices; can easily obtain alternative compatible lav mics; runs on ubiquitous AAs; great sound for the price. Cons: permanent antennae (non user-replaceable); non-diversity; included lav is rather large; no way to power from NP1/BDS system; can't simply look down into bag to check wireless status. All in all, I like them, especially for the price. But you get what you pay for, and the Sennheisers weren't nearly so bullet-proof as the Lectros that I've used in the past (of course, I'm still getting my feet wet, so I'm sure we could chalk some of it up to operator error:). The Sennheiser G2s would be a great choice for someone starting out or on a budget. MSRP for wireless: $825 for standard kit; $1135 for ENG; can be found much cheaper on the street. Great blog, man! There's nothing like learning from pros like yourself who deal with sound issues each day and find creative ways to solve them. Thanks for sharing what you learn with us! You might want to check out a sound recordist friend of mine's blog (she blogs anonymously) at http://lifebelowtheline.blogspot.com. Thanks! I just hope that, as I learn things the hard way, other people can benefit. And, yes, I'm a big fan of BTL. She perfectly articulated the uncomfortable nature of having to wire intimidating people, which I linked to a while back. Tell her to keep up the good work! I have been using the Sennheiser Evolution and Countryman B3 together this summer myself. I share your enthusiasm for both. Using them in tandem, I've only had one day of mysterious interference. Whooshing kinda interference. It wasn't the HVAC or anything like that. And, oddly, when we were troubleshooting we tried out the Sennheiser lavs that come standard with the Evolution receivers. No interference. Very odd. We never did figure out what it was. And the next day (different location) we were back to using the B3s. Odd. I never thought to trade out the mics (usually, I can't, because the majority of what I do necessitates wiring under). I guess they're very environmentally sensitive as well. I uesd them yesterday, on a contruction site, at a distance of about 60-70 feet, and it was clear as a bell. Granted we were out in the country a bit, and thus free of RF, but still, I was surprised.